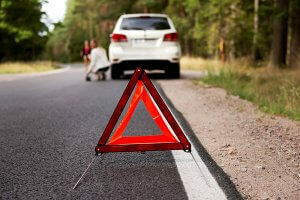 Personal Injury Attorney > Car Accidents > What Info Should I Gather at the Accident Scene? CAR ACCIDENT SCENE: WHAT INFORMATION DO I NEED GET? A split-second error while driving can result in an accident. It can be a “fender-bender”, or a much more serious accident if people are injured. In Louisiana, the law states that you must stop as close to the accident scene as possible. You cannot leave the scene, or you will face hit-and-run charges. The first step is to check for injuries to yourself, other drivers and passengers. Then call an ambulance if needed. The next step is to call the police and report the accident, giving your information and the location. You may be in shock from the accident, even if you are not badly injured. If you are able, it is very important to try to get as much evidence as you can at the scene. Even though the cause may seem clear, such as weather conditions, or a hit-and-run, all facts are not known. An important part of the evidence is the police report, so be sure that you wait until that is done at the scene. Get information from the other drivers: name, address, license number, the plate numbers and their insurance company names. Provide your information as well to the other drivers. Keep it short and do not discuss the accident. Try to find witnesses at the scene; get names and contact information from them. Take pictures of the scene with your phone; ask others if they have pictures you can copy. Look at the damage to the vehicles, and the area itself for evidence. Take pictures, or draw a diagram if you can. Make notes about weather conditions, skid marks, or anything else that you want to remember. Contact your insurance agent. You should report even a minor accident, for if there was more damage than you thought, you would be paying for it. Be sure not to talk to any other insurance agents or others at the scene. Talk only to the police and give the facts as you know them. They will investigate and collect their own evidence. Be especially careful that you do not apologize for anything. You must wait for all of the facts before the cause is known. Of course, if you have physical injuries, you need to get medical care immediately. You may not be able to stay at the scene. It may be that you need someone to go to the scene to gather evidence, so get help if you can. Be sure to keep all receipts of any treatments and follow-up care. The same is true for damages to your car. You need the records for repairs, a rental car, etc., so be sure you keep all documents. All losses and injuries must be proven in order to get compensation. There may still be many questions after a car accident. What if you were hit by an uninsured driver? What if you were partly at fault for the accident? You can see that your accident can be more complicated than you thought at first. It is important to consult with a Louisiana car accident attorney. The Law Offices of L. Clayton Burgess can provide you with a free consultation. Whether it is a claim for your insurance company or for a court case, they will do a thorough investigation and get a fair settlement for your damages.